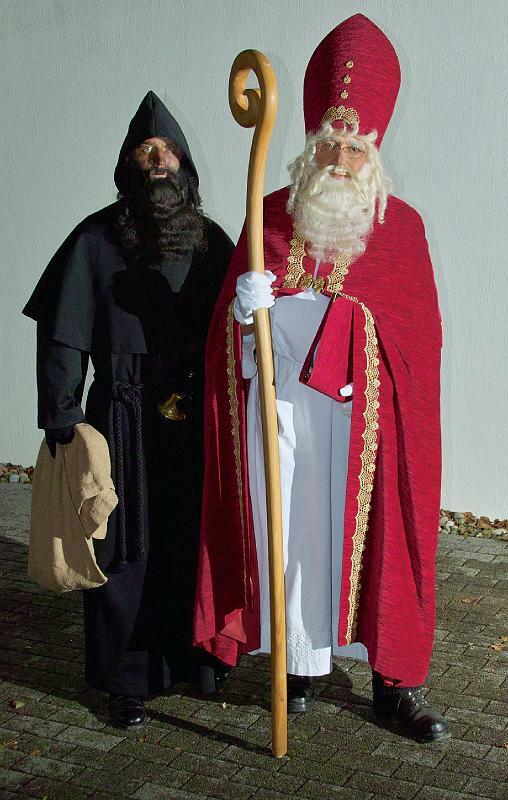 Samichlaus and Schmutzli in traditional Swiss costume. “coal” bearers, often with coal-blackened faces, and who carry large baskets with some coal, a besom broom, and I’m sure a bit of room for gifts given back to them by grateful parents). They sit down to speak with each child, reading from a great book they carry with them. Each child is then given a “Samichlaus” bag, and perhaps a gift sponsored by the parents. Now Swiss Samichlaus and Schmutzli are not the hygienically, politically correct version of countries like America; the large sack they carry was originally (and up into my husband’s generation) shown to bad children who might get kidnapped and taken off if they don’t learn to behave before their visit the following year (they still might threaten it here and there even today). It might have something to do with Swiss children in general being so well-behaved… Children are in general very respectful of Samichlaus and his two assistants, even though Mr. Fetz (pictured) looks more like a big teddy bear than someone who might threaten to kidnap naughty children! Rather than reindeer, here in Switzerland Samichlaus and Schmutzli lead a donkey laden with gifts. Now I have it on good authority (our local “Unterländer” newspaper) that there are precisely 8,356 donkeys registered in Switzerland to help on the day. 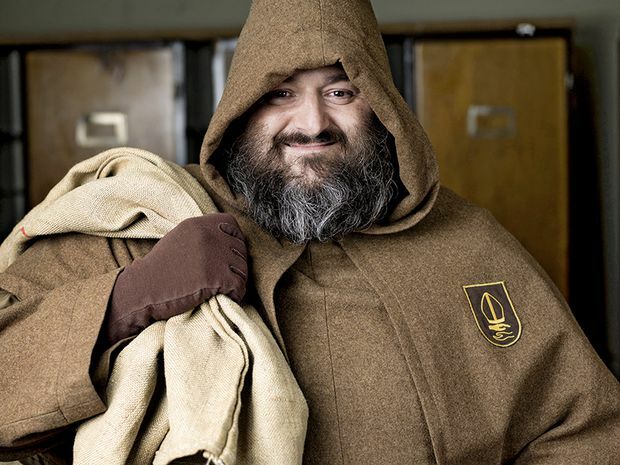 As Swiss are very nature-minded, there are strict regulations with how much a donkey is allowed to work or carry: They are only allowed to carry up to 90 kilograms, and only 25 kilometers per day. 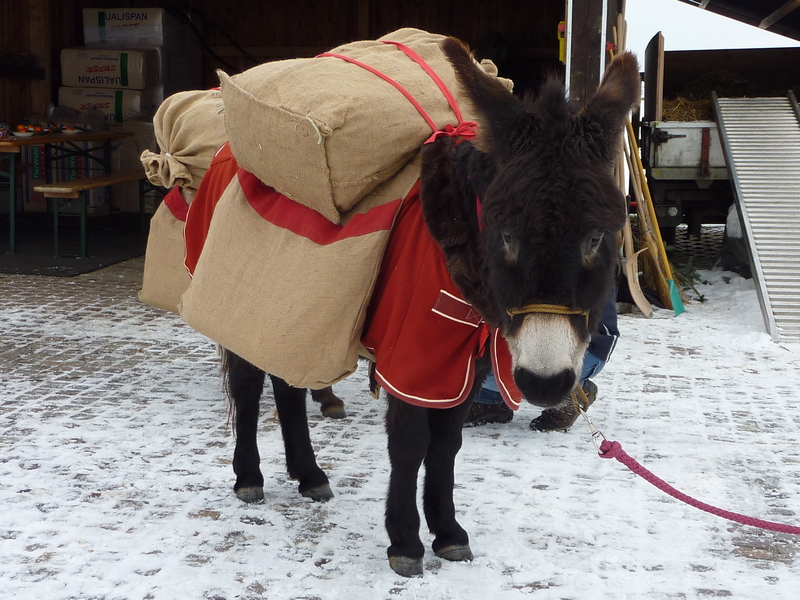 That means that these donkeys could carry a one-kilo gift to each of the 715,000 4-to-12 year olds in Switzerland! One of the 8,356 Swiss donkeys, ready to go! Since 6 December is the official Samichlaus Day, it is customary on that day to give “Samichlaussäckli” (Santa Claus Bags) to friends, family, neighbours and coworkers. They are great winter gifts to take when visiting friends; if you’d like to know how to make one, please click here. Posted in Historical Guides, History, Seasonal, Tips & Links and tagged Christmas, Gifts, Link, Samichlaus, Santa Claus, Schmutzli, Swiss traditions, Switzerland. Bookmark the permalink.